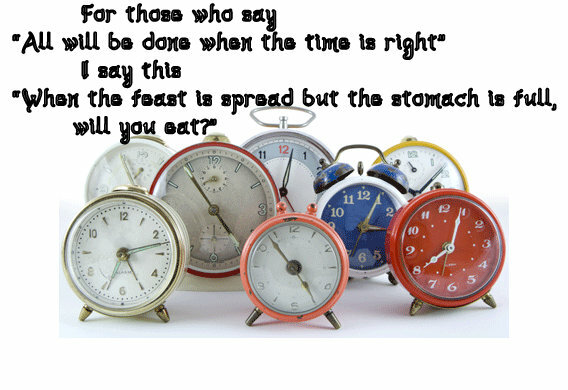 The ‘Right Time’ is not dictated by the hands on a clock. This will probably really offend some people; however it isn't intended that way. I say this with all Humility, Love and Respect, but I do feel it needs to be said. We've all heard it, many of us also say it - “When the Time is Right...” - But do we mean what we’re saying, or is it that we aren't saying what we mean? While the Wright Brothers were building the airplane, skeptics would say, "If God had meant for us to fly, he would have given us wings." the same was said when we flew to the moon, or an ancient time example was the world is flat syndrome, and who ever sailed to the edge would fall over and disappear for ever. Many were waiting “until the time was right. While a few understood that rather than wings, our creator gave us Intelligence to build those wings, to travel in space, and to investigate rather than fear. Everyone has probably heard the story of the guy who prayed to God everyday "Father, please let me win the lottery today" after many days of saying the same prayer, of enduring the same disappointment of not winning, he grew angry and shouted at God. "God if you are as powerful as everyone says you are, then why didn't I win the lottery?" God answered this way. "My son" God asked, "why didn't you buy a ticket"
So what's the difference between "when the time is right" and missed opportunity? Or is there any difference really? We see those who prepare and seize the opportunity without delay or excuse - sorta like riding the old merry go round, we waited until we reached that brass ring - When we get there and grab that ring, the time waiting was well spent, but if we fail to grab it, all the waiting was a waste. That brass ring is Opportunity. Don't miss it waiting on the "right time." Much can be said about preparation and all of it is true. We plan a party, prepare the feast, decorate the hall and all the tables - all is ready, but no-one comes. Why? We didn't invite anyone, we didn't buy the ticket. It's not the clock or calendar that dictates our fate, or controls our destiny, our actions do. We already have the tools, although we may need to clean off the rust. We have the ability, the talent, and the skills. We are prepared, all we have to do is seize the opportunity, and we will realize the Time is Now! No one can tell us when we are ready - We alone can determine that.